A covered call strategy which I use on a regular basis is to write out of the money covered calls on volatile stocks. When picking stocks for covered calls, one of the key criteria is the option premium. In many cases, the premium paid by the buyer of your call option does not really warrant losing out on the upside potential. As a minimum, I like to ensure that the option trading strategy which I use will return at least 15 percent per year. The trades shown below will outline one of the current covered call strategies which I have used. 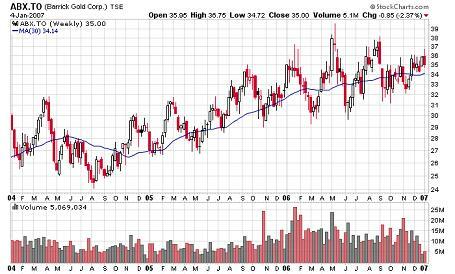 In this example, I purchased 1000 shares of Barrick Gold (ABX on Toronto) for $30.85 on June 15 because it looked like it was coming off of long term resistance as seen in the free 3 year weekly chart shown above and breaking through short term resistance as shown on the daily chart shown below. Besides, the information I had at that time indicated that we were in a long term commodity bull market and Barrick is sitting on a lot of gold. This stock pays a dividend and when you sell a covered call, you still receive the dividends up until the time the stock is called away from you and you are no longer the owner of the stock. At the same time, I sold the July 34 calls for a profit of $360. These calls were briefly in the money before they expired worthless. I sold these calls as they provided a bit of premium but also would have given me about $3000 in profit had the stock been called away. Next, on July 25, I sold the September 34 call options for a profit of $1,310. I sold the 2 month calls at this time as I was going away on holidays for 3 weeks and did not want to be bothered selling another call during the holidays. Also, September is generally a poor month in the stock market and I was not too concerned about having the stock called away. Although I could have done much better by not selling the calls and selling the stock at the end of August that was not my strategy for this trade. The calls eventually expired worthless on the 3rd Friday in September. I then sold the October 36 calls for a profit of $260 on September 26. These calls expired worthless and never were in the money. On October 25, 2006 I sold the December 36 calls for a profit of $960. While these stocks were briefly in the money they ultimately expired worthless as well. In this case, Christmas was on its way and I was traveling so again, I did not want to be bothered with monitoring the stock. After the December call expired, I sold the February 2007 36 calls on December 19 for a profit of $1,205. When I sold this one, I was thinking that this time I will lose the stock. 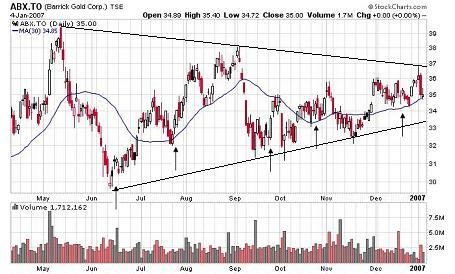 As shown on the daily chart, the stock appears to be getting close to either breaking down or up. If it breaks to the upside I plan on buying it back on a correction and if it breaks to the downside I will sell another call. As expected, the stock was called away on the 3rd Friday in February after closing above $36. Therefore, let's look at a summary of the trade. The total profit on my covered calls was $4,095. This was accumulated from June 15, 2006 to February 16, 2007 or essentially eight months. On a percentage basis, trading options on this stock has returned 13.3% over 8 months or about 20% on a yearly basis. As the stock was called away at $36, I gained about an additional $5000 or 16%. All in all, not a bad return resulting in a qualified winner. When writing covered calls you have to be willing to give up the potential windfall if the stock takes off. Sooner or later if you continue to use a covered call strategy, you will experience a major advance on a stock you have sold calls against. This is all part of the game. On a cautionary note, it is generally not a good idea to write calls against a falling stock. The drop in the stock price will almost always be greater than the option premium which would make this covered call strategy a loser. Before you start to use a covered call strategy, you may want to learn more about selling calls. If so, check out our covered call section. If you are interested in obtaining more information on how to trade options, you may want to follow this link to an option trading strategy which was featured in "Multiple Streams of Income" by Robert Allen. When you are looking at different systems being offered you should try them out for a while, see if they fit your trading style and determine if you are being given good information that will ultimately help you progress as a trader.